A problem in supply chains today is that farmers do not get paid upon delivery of their produce, while buyers lack access to finance that will enable them to pay farmers on time. Photo credit: ADB. The agriculture industry is responsible for providing food and fiber to feed and clothe over 7 billion people. It also employs over 40% of the global workforce. As demand and consumption increase, there is pressure for supply chains to be more efficient. However, there are many issues surrounding supply chains. Some $40 billion is lost annually due to global food fraud, farmers risk not being paid, and only 43% of suppliers are confident in sharing data and collaborating with partners. During a knowledge sharing event at the Asian Development Bank (ADB) in Manila, Bridie Ohlsson, project lead for blockchain at AgriDigital, shared their experience in using blockchain to make transactions more efficient and transparent for farmers, buyers, and consumers. Founded in 2015, AgriDigital is a Sydney-based start-up agtech (agriculture technology) company that develops software solutions to make global agricultural supply chains simple, easy, and secure. What are the issues affecting supply chains today? There are enormous leaks and risks in supply chains. Supply chains typically work with silos of information. Organizations keep data around trade flows, financial flows, and information flows very separate, within an organization and with other organizations. Thus, it loses its ability to leverage information to develop new products, provide traceability, and improve efficiencies across the supply chain. This leads to delays, fraud, and counterfeit goods moving along the supply chain. CIF = cost, insurance, and freight; DCT = digital control tower. There are three big problems associated with supply chains today. 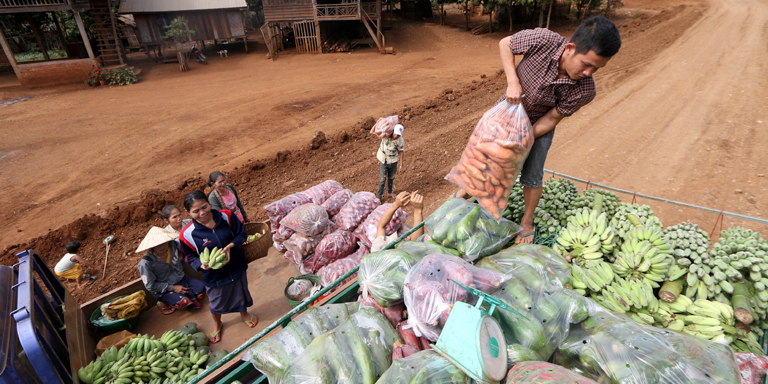 Farmers do not receive payment upon delivery of their commodities. On the average, payments in the Australian grains industry take from 2 to 5 weeks. Buyers do not have access to finance that will enable them to pay farmers on time. Commodity-backed finance is complex and risky and very few financiers are willing to lend. Consumers lack trust and access to verifiable information around the status and quality of goods. Data, trade, and finance flows should be integrated resulting in a streamlined supply chain where all the players across the agricultural supply chain—farmers, buyers, storage operators, and consumers—operate and interact on one platform, sharing and leveraging datato deliver innovative products and services. The supply chain should enable greater transparency and security around the data and the products and commodities that are moving. It supports peer-to-peer transactions, removing the need for an intermediary to facilitate transactions. Information is distributed in a network and not centralized. Data storage is immutable and secure. Changes to the network require consensus among participants. What are some of the use cases of blockchain in the agriculture sector? In 2017, AgriDigital successfully completed a pilot that generated a digital title for a commodity and executed payment on the blockchain. The pilot was carried out with CBH Group, Australia’s largest cooperative and a leader in the Australian grain industry. CBH’s wholly owned subsidiary, Blue Lake Milling, functioned as buyer and processor of oats. Upon delivery of the oats to Blue Lake Milling, a digital title was generated using AgriDigital’s commodity management platform and kept in the grower’s wallet. Information on the quantity and quality of the oats was captured providing a robust view of the commodities. Using a smart contract, payment was made from the buyer to the grower, and simultaneously the asset (digital title) was transferred from the grower to the buyer. This eliminated counterparty risk, providing full security to the grower and clear visibility over ownership of the commodity. The pilot also traced the movement of organic oats from farmgate, through milling and production, to retail consumer. During critical stages of processing, data was stored and analyzed on a blockchain to prove the organic status of the oats. Because blockchain was used, it was immutable and consumers were guaranteed of the provenance and quality of the goods they purchased. AgriDigital partnered with Rabobank to deliver a true commodity-backed financing product. In this financing scheme, the trader acts as a Rabobank agent. Rabobank makes use of a trader’s facility wallet to address the financing gap between the time the commodity is delivered by the grower and the time the trader has a ready buyer. The grower delivers the grain to the warehouse. A digital asset is issued to the grower’s wallet, which includes details of the quality and quantity. The grower sends the asset directly to the trader’s facility wallet. At the same time that the asset is transferred, payment is executed from the trader’s facility wallet to the grower’s wallet. This gives Rabobank a clear view of the digital assets that it owns. The farmer receives digital money which can be easily converted to fiat money. A = Rabobank issues Australian dollar (AUD) token to the agent’s Rabobank Facility under master agreement. B = Grain delivered and registered at warehouse. C = Digital title to the grain is issued to grower by site operator of warehouse, in this case the trader acting as site operator. D1 = Grower allocates the grain to purchase contract with trader as agent for Rabobank. D2 = Smart contracts execute payment from Rabobank to the grower in AUD token, ownership of digital title grain token transfers from the grower to Rabobank. E1 = Trader requests to purchase the grain, which is the subject of the sale contract. E2 = Smart contracts execute payment from trader to Rabobank and beneficiaries in AUD token. Digital title transfers from Rabobank to trader. *Trader is acting as the site operator and agent for Rabobank in the purchase contract and the final buyer of the grain. When the trader is ready to sell the grain, the digital asset will be moved from the trader’s facility wallet to the trader’s digital wallet. At the same time, the trader makes a payment back to the facility wallet. Through this financing arrangement, documentation requirements are lessened, streamlining the process and shortening the processing time. What are key considerations to enable full utilization of blockchain technology in the agriculture sector? A challenge with using digital systems is matching the physical with the digital. The business process must ensure that what is specified in the system accurately represents what can be found in the warehouse. Available technology, such as weighbridge integration and quality testing instruments, can be used to reconcile the two. In case the technological infrastructure is not yet in place, a declaration-based process involving manual human data input can be followed. Note however that human interaction may increase the risk of error and compromise the integrity of data. In the same manner, for payments, the digital money must be backed by fiat money to achieve real-time payments. In the CBH pilot, payments on the blockchain layer were parallel processed using traditional banking methods. For the Rabobank financing product, a Rabobank-backed digital dollar was used. AgriDigital. 2018. Pushing Boundaries with Rabobank.Blog post. 11 January. AgriDigital. 2016. AgriDigital successfully executes world’s first settlement of an agricultural commodity on a blockchain, enabling real-time payment on title transfer for Aussie grain growers. News release. 8 December. A. Lewis and H. Roxas. 2018. Promoting Financial Inclusion through Distributed Ledger Technology. Development Asia. January. FinTech Australia Newsroom. 2016. Full Profile’s AgriDigital successfully executes world’s first settlement of an agricultural commodity on a blockchain. FinTech Australia. 9 December. k-Learn. Exploring Opportunities for Blockchain Technology in Financial Inclusion and Sustainable Development. Bridie Ohlsson manages blockchain pilots to develop solutions to challenges in global supply chains. Before joining AgriDigital, she worked on research, policy analysis, and compliance in the legal and not-for-profit sectors. She holds a Bachelor of Laws from the University of Sydney and a Bachelor of Arts in French and Politics from the University of Sydney and Sciences Po, Paris. She is the founder of sustainable food production startup, Crecos.